Here’s a rough guide to CD mail order costs and working them out. urgency—more urgent is more expensive. The detailed example on this page allows £1.50 which is probably the most you’d pay for a low volume, full colour job. If you’re pressing a high volume (thousands) and it’s not urgent you could pay half that. There’s more about duplication in CD release. I weighed the different packing examples and got them priced for postage in 2010. This is just an illustration, you may choose other options. I allow for a light case by First Class post (80p post and packing). Digipaks and other light cases are more expensive to buy than standard CD jewel cases but cheaper to post, although wallet sleeves are cheapest all round. You can also get mailers cheaper than this (the cheapest I found is about 6p CDs, post and packing). The standard jewel case is the cheapest rigid case but the most expensive to post (again, you could use cheaper mailers). There’s quite a range of packaging, mail order and payment methods. You can find a lot more about packaging options online. Try a small sample to start with, you can always change your mind when you see how it works. You only need to commit to volume for the final pressed CDs. The Royal Mail web site has details of other postage prices including Air Mail. Here are some links to more information about CDs, postage and packing choices. To decide an all-in price you could add up the costs and guess a margin. This example should help you see the effect of changing various slices of the pie. First list the costs you think you might need to cover. Whether you allow for these examples or not depends who’s involved and the expected volume of sales. Computers, software, instruments, project recording costs, online payment setup, etc. Web site (cost details), annual payment gateway fee, consumables, accountant, MU fees, etc. 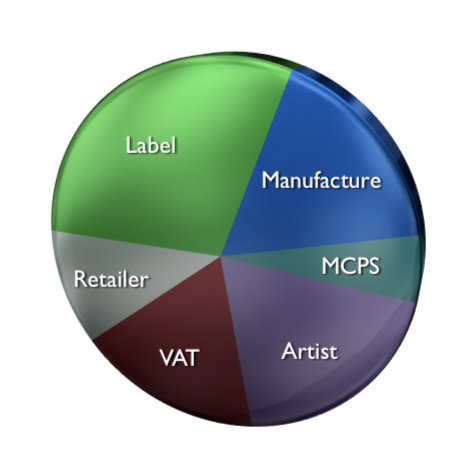 Some one-off costs and running costs might be paid out of writer, artist, label or publisher income. This example will assume the artist is also the performer—otherwise allow for session payments or points. When you’ve got rough cost headings you can work out a price. CD, post and packing totals £2.30 (see above). These are just assumptions for this example. You might want to do some things differently. You can use the same basic idea to work out known other money amounts and percentages. As you can see the numbers you choose can make a big difference the result and you can tweak them to get a price that feels right. The benefit of using headings like these is you’ll be able to check how much of your total is allocated to each part. This example assumes 20% general one-off and running costs, and if you don’t have evidence for that it’ll become taxable as income too. The price you charge is up to you but be sure tax is covered. At this price you’d need to pay VAT on about 10,000 CD sales a year, so keep 17.5% safe unless you’re certain you won’t sell that many. The last stage in this example is to add the online credit card and posting costs. You will already have paid or accounted for VAT on your post and packing materials. The credit card commission will be charged on the whole amount you collect at the point of sale. 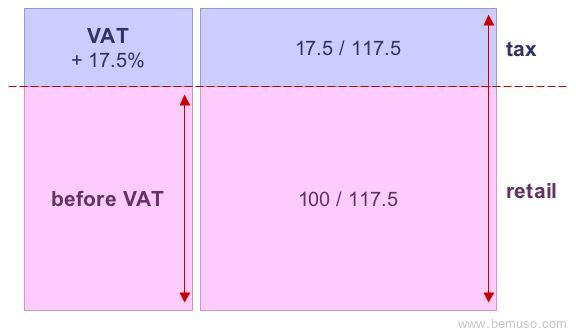 Here’s how to add and remove VAT, and how to work out what the VAT amount is when it’s already included in the price. Use enough decimal places for the precision you need—truncating fractions of pennies is OK (unless you multiply those amounts by a very big number later on). By way of comparison a £15 high street CD breaks down rather differently. There isn’t a standard or average breakdown—a lot depends on the artist’s deal with the label and the number of records sold. 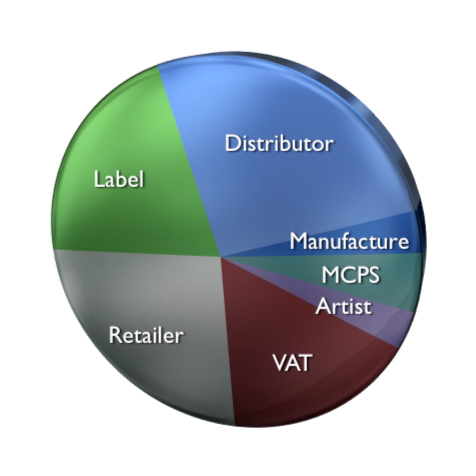 Distribution costs vary from 25%-30% down to 12% for a hit, or as low as 5% for a big Major label artist.